Hey why not? The season is boring and 2021 seems to be what the front office is pushing for, so let’s have a little fun and see who could be on that roster when the team expects to be contending for division titles again. That’s an interesting year because the White Sox should theoretically be really going by then with all their top prospects while the Indians seem destined to be down a bit after losing so much in free agency. The Twins are the Twins, so who knows? And the Tigers? Well, they’ll also be there. Salvador Perez ($13 million) – He’s still going to start, and maybe he won’t play every single day, but he’ll get the bulk of the playing time behind the plate. Meibrys Viloria ($575,000) – He’s keeping this seat warm for M.J. Melendez in 2022, but he does a nice job as a backup catcher. He’s not much of a hitter, but he’s fantastic behind the plate and has a really good arm. Kelvin Gutierrez ($575,000) – I’m not sure why, but I believe in Gutierrez and think he actually becomes a really solid third baseman for this club for a few years, a la Joe Randa. He’s sure-handed and has some quality bat control. The power seems to be coming a bit. Nicky Lopez ($800,000) – Probably the best batsman in the organization, Lopez has a chance to be the team’s second baseman for a long time. He can handle shortstop, but a double play combo with Lopez’s steady hand at second is a nice thing to think about. Adalberto Mondesi ($1,400,000) – I don’t think he’ll be a star, but he’ll be a step or two below. He makes all the spectacular plays, boots some of the easy ones and steals a ton of bases. The power potential is always intriguing. The low OBP is always infuriating. Frank Schwindel ($575,000) – Frank the Tank has taken awhile to get his shot, but continuously hitting in Omaha will get him the opportunity to crush lefties at the big league level and platoon with a free agent bat for a bit. I think it’ll work out pretty well for him too. Eric Thames ($7,000,000) – The Royals will believe Nick Pratto needs one more year before he’s ready to be a big-time contributor. Of course things can change, but in the interim, they need a bat to play first and Thames represents a bit of a shift in philosophy for the big club. Aaron Hicks ($14,000,000) – Coming off some solid seasons in New York, the Royals want to find a veteran to patrol center field who won’t require a huge, long commitment, so prior to the 2020 season, they’re going out and picking up Hicks on a three-year deal. Yes, they probably overspent, but it gives them a switch hitter who can handle center or right quite well, depending on the needs of that night. It might seem odd now given all the outfielders in the big leagues or on the way, but on a deal that expires after 2022, it made some sense as a bridge. Khalil Lee ($575,000) – Lee will get a shot at a September callup in 2019 and will spend about half the year in the big leagues in 2020. I’m looking toward a strong finish in 2020 to make him ready to play mostly left field in the outfield with the best throwing arms in baseball. As one of five center fielders on the roster, the outfield defense will be stacked and the potential for greatness is way up there. 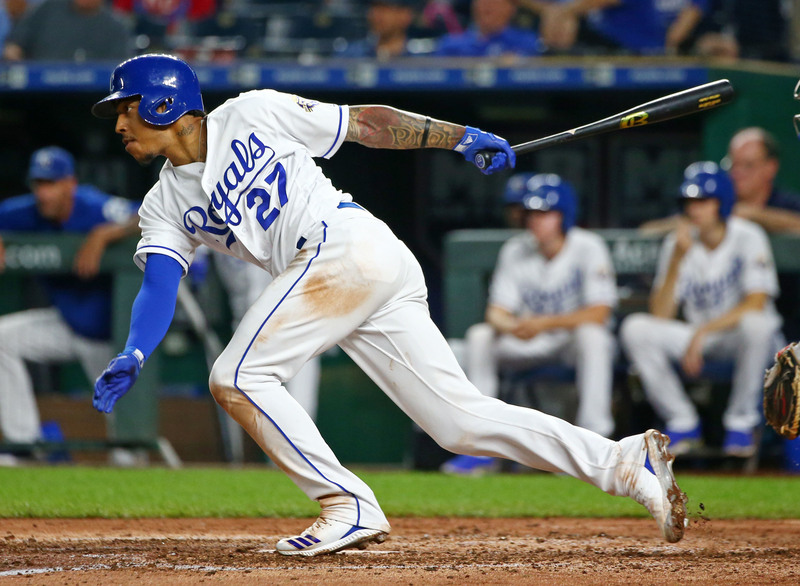 Blake Perkins ($575,000) – Another switch hitter who can really go get it, Perkins will get to play sort of the role of Jarrod Dyson in that he’ll probably get into about 110-120 games with a lot as a pinch runner. There won’t be much need for a defensive replacement, but Hicks tends to need some time off here and there, so Perkins can slide in easily in center and can draw a ton of walks when he plays. Brett Phillips ($1,300,000) – Still straddling between a piece of the future and a bridge to that future, Phillips will likely get most of 2021 to show that he’s an important cog in the Royals machine. He strikes out too much and the power just isn’t quite where you want it for a guy who is now spending most of his time in a corner, but he’s a solid player who provides a ton of value as a defender at the very least. Kyle Isbel ($575,000) – A scorching hot start after he was drafted made it seem like Isbel was on the fast track to the big leagues, but he’s slowed down slightly in Lexington, though not that much. Isbel profiles right now as a fringe-ish starter, but given his ability to handle some infield work, he has a spot on teams with dwindling position player rosters. He can work a walk and has a little pop and good bat to ball skills. If someone goes down, you can do far worse than Isbel filling in. Danny Duffy ($15,500,000) – This is the last year of Duffy’s deal, and I believe he’ll play the whole thing out with the Royals before moving on. Still effective, but injuries don’t figure to get fewer and farther between as he gets older. Daniel Lynch ($575,000) – Lynch was not one of my favorite draft picks, but he hit the ground running and has no intentions of looking back. He’ll get a September callup in 2020, a bit like Yordano Ventura in 2013 and then basically force his way into the 2021 rotation with a strong spring. He’s young, so there’ll be hiccups along the way, but he’s a nice addition. Brady Singer ($575,000) – Singer will get his first shot in 2020 and will show inconsistent results but flashes of potential during his debut and will earn a spot in the big league rotation out of spring training. It’s not all daisies and rainbows though as he will struggle through a bit of an uneven year with way too many home runs allowed. Jameson Taillon ($7,300,000) – The Royals will see Taillon as their James Shields for the next wave and will do what they can to go get him, giving up quite a few prospects in a trade a lot of people who are a bit more analytically inclined hate because the Royals aren’t ready to win yet, but that a lot of people who are less analytically inclined love because they love getting a top notch big league pitcher. Julio Teheran ($17,000,000) – The Royals will count on a bigger park doing wonders for Teheran when he becomes a free agent after the 2019 season as a pitcher who can help headline a rotation with the young guns. For five years and $70 million, the contract will give some memories of the Ian Kennedy deal, but at least Teheran has better stuff. Jason Adam ($1,200,000) – Things haven’t gone well for Adam in his big league debut. The home run ball has not been his friend, but it’s not all bad. He’s gotten a lot of strikeouts and done well enough in limiting hits. It’ll take some time, but he’s going to be a solid middle relief type and will be a key part of a very good bullpen in 2021. Cody Allen ($11,000,000) – The Royals will look to improve their bullpen immediately and they’ll likely be making a similar mistake to the Soria deal in giving Allen three years and $24 million with the 2021 season being the crescendo at $11 million. Still, he’s a Proven Closer™ and the Royals really want that to help fix this bullpen disaster even though he won’t be closing at the end of the deal. Sean Doolittle ($15,500,000) – The Royals have liked Doolittle for awhile, so I imagine they’ll overlook his injuries this year and some in previous years to give him a big time overpay on a four-year deal worth $49 million. Great control, swings and misses and nearly unhittable relievers aren’t out there all that often, so they had to make a push for him, but knowing the payroll would be manageable at the end, they can backload it. Carlos Hernandez ($575,000) – Hernandez will get the opportunity in 2021 to make some spot starts and work as a long man out of the bullpen to get his feet wet. He’ll also spend some time in Omaha, but that’s okay. Brad Keller ($1,900,000) – I know people will wonder why Keller is in the bullpen when he’s been so good as a rookie in the rotation, and that’s fair. I just think some of his issues as a starter will make it tough for him to stay there when there are better options, and he can be a really valuable member of a staff who can go multiple innings and can coax a double play grounder when needed. It’s not that he necessarily couldn’t fit as a starter, but on this team, the bullpen is his spot. Jackson Kowar ($575,000) – There’s a potential future in the rotation for Kowar, but I think the 2021 Royals will really enjoy his stuff coming out of the bullpen to get his feet wet and ending up pitching late in games quite a bit in 2021. Richard Lovelady ($750,000) – A duo of Doolittle and Lovelady from the left side is going to be pretty tough to beat in 2021. Lovelady will be in his third year and will be at his very best, taking the majority of save opportunities for this particular Royals club. Glenn Sparkman ($600,000) – I will always like Sparkman as a bullpen option and I think he and Adam can be a really solid middle relief duo. Plus, he can give you two or three innings when needed, so he’ll be a big part of a modern bullpen. The total payroll for this squad that looks much improved from what we’ve been watching this year checks in at $114 million, which isn’t all that bloated at all. They’ll be worth 34.8 WARP in general, which puts them as an 83 win team or so. If the bullpen overperforms, they might get an extra three or four wins out of it. All in all, not too shabby I guess. If this is the first step, it’s a good one. If this is a peak, it’s a problem. If that’s the future, fire Dayton Moore. This is a fun piece, David. I cannot see giving $14 million to Hicks. The Royals seems have so many toolsy guys to man CF already. Guess you do not project them to develop. Interesting…but I think that 2 or 3 of Whit, Soler, Boni, O’Hearn and Goodwin will be on the 2021 team. I think that both Junis and Keller will be in the starting rotation. Hill, Staumont and Newberry in the pen. Pump the brakes on Lee, Isbel and Perkins. Very bold predictions David. Are you predicting that we flip Boni or Soler for Taillon? Looks like 2021 would be Taillon’s 2nd year of arbitration and then he would be a free agent in 2023. Or what prospects do you think we would flip for Taillon ? To be honest, I didn’t get into the names. If they’re going to do something like that, it’s likely going to include guys who aren’t even in the organization yet. I doubt Boni or Soler would be of interest to the Pirates, though.